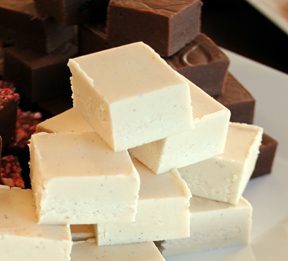 This scrumptious fudge recipe comes from one of our favorite blogger/bakers, “Miss Humble,” keeper of Not So Humble Pie. It’s perfectly rich and creamy and will put that bottle of Baileys in your home bar to good use. Line a 9×9 inch pan with foil and coat with a little butter or nonstick spray. Combine sugar, butter, heavy cream and Baily’s into a heavy-bottomed saucepan and bring to a boil over medium heat. Once boiling, attach a candy thermometer and reduce the heat to a hair above medium low and cook for 7-10 minutes until your thermometer reads 234° F, stirring constantly. This is the one instance when it’s okay to use the words julep and blender in the same sentence. Blasphemy never tasted so good.